Product categories of Air Blowing Type Gravity Separator, we are specialized manufacturers from China, Air Blowing Type Gravity Separator, Gravity Separator Machine suppliers/factory, wholesale high-quality products of Grain Sorting Machine R & D and manufacturing, we have the perfect after-sales service and technical support. Look forward to your cooperation! 1. This Blow Type Specific Gravity Cleaning Machine is to produce proportion segregation phenomenon under stress of aerodynamic and vibration friction of graininess material. 3. This machine is to remove blighted seed, budding seed, damaged seed (by insect), rotten seed, deteriorated seed, moldy seed, non-viable seed, seed with black powder sick and light impurities from wheat, corn, paddy, sunflower seed, melon seed, legume, etc. This machine is according to segregation phenomenon of granule and density under fluidization process, for achieve materials delaminating and mutual exchange, at the same time the wind pressure and amplitude need be adjusted. Specific Gravity Separator is used to classify materials according to density or specific gravity. 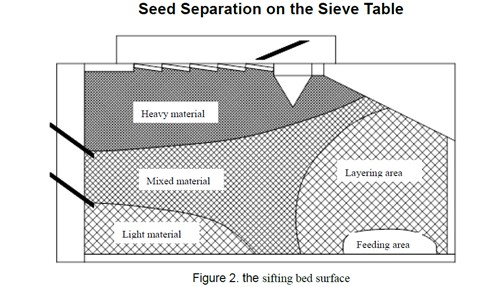 This is important when seed and/or impurities are similar in size but different in density. The separator uses a vibrating perforated deck that can be tilted in two directions at various pitches. Air moving through the perforated deck separates the seed and any impurities by weight as the deck oscillates.